Technology transfer in emerging knowledge areas such as the bioeconomy is strongly challenged. The related challenges are attained to the differences in perceptions, objectives, values and motivations between academic scientists and firms stemming from different disciplines and industries. Group concept mapping, an exploratory and bottom-up participatory method that brings together stakeholders to represent their collective perceptions, was therefore applied to investigate challenges in technology transfer. Using this approach, this study is able to offer the first overview of factors affecting technology transfer in the bioeconomy through the aggregate representation of the perceptions of different stakeholder groups (i.e. academic scientists, technology transfer facilitators, and firms/entrepreneurs). These factors are visualized in form of maps by means of multidimensional scaling and hierarchical cluster analyses. Furthermore, a quantitative ranking of the factors is used to demonstrate the degree to which the importance of the perceived factors differs across stakeholder groups. Factors related to interdisciplinary collaborations and collaborations between academics and firms as well as those tied to financial issues or consumer acceptance are assigned the highest level of relative importance. However, these factors are also characterized by the lowest level of relative coherence across key stakeholders. 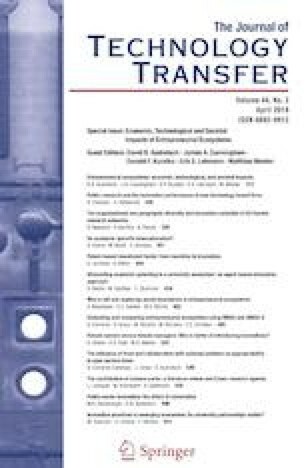 Finally, managerial and policy recommendations for cultivating successful technology transfer in the context of other interdisciplinary and emerging knowledge areas are suggested. The scientific activities of the Bioeconomy Science Center were financially supported by the Ministry of Innovation, Science and Research within the framework of the NRW Strategieprojekt BioSC (No. 313/323-400-002 13). Furthermore, the authors would like to thank Dr. Nina Preschitschek for her support and advice in the first phases of the study.